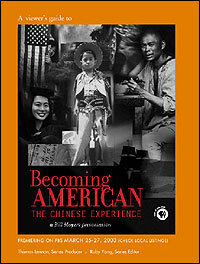 This 12-page viewer's guide for BECOMING AMERICAN: The Chinese Experience provides viewers with background information on the series, including program summaries, timelines, and bibliographies. It also features a variety of historical photographs and other primary sources important to the Chinese American experience. These materials prompt reflection and promote discussion of the process of "becoming American." A broad range of questions and activities accompany these materials to aid viewers in an exploration of the complicated relationship between individual, ethnic, and national identity. This 48-page multidisciplinary study guide for BECOMING AMERICAN: The Chinese Experience meet a variety of classroom needs. Part 1 provides students and teachers with an introduction to the major themes explored in the documentaryidentity, assimilation, citizenship, and tolerancethrough brief readings and activities. Part 2 is a resource for teachers and students. It includes program summaries, timelines, and bibliographies as well as questions and activities that prompt in-depth discussions of the series as a whole. Part 3 helps teachers and students integrate the series into the scope and sequence of an American history or literature course by offering readings, and activities that focus on the series section-by-section. Facing History and Ourselves is also supporting classroom use of Becoming American by offering workshops in six cities across the country. Detailed information concerning the location, date, and times of these free workshops can be found at www.facinghistory.org.